High accuracy pressure gauge for portable use to check and test theme park ride pneumatic air control systems, capable of measuring 0 to 3 bar g pressure with 0.05% accuracy and connected using a 1/4 BSP P male fitting. Also includes a UKAS calibration certificate for traceability. Many of the pneumatic control systems used in theme parks are critical to the safe operation of an amusement ride. Pneumatic systems are used to open & close safety barriers & doors, apply brakes and operate ride restraints. Pressure sensors and switches are used to provide feedback to control systems. 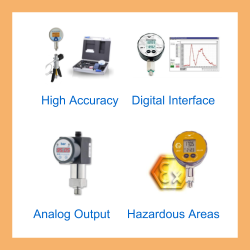 To ensure there is confidence in the performance of the compressed air sensing devices, each one needs to be regularly tested to monitor changes in accuracy and compare to manufacturer specifications and application requirements. The performance of a pressure sensor or switch can be checked using a traceable pressure standard, or in other words a trusted pressure measurement device which has an accuracy that is a few magnitudes better than the devices being tested. For convenience it is necessary to bring the test equipment to the compressed air sensing devices, therefore battery powered high accuracy digital pressure gauges are ideal instruments to carry out in-situ pressure tests. 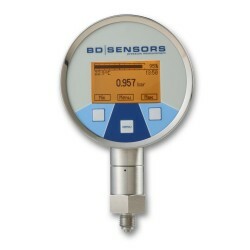 A digital pressure test gauge consists of a digital readout unit and pressure sensor for portable use to measure air pressure over 0 to 3 bar gauge to an accuracy better than 0.05%. The DM 01 high accuracy digital pressure test gauge which can be used to check amusement park pneumatic control systems is powered by an internal battery and is connected to the physical pressure measurement point using a 1/4 inch BSP parallel male thread process fitting. For incorporating test results into documentation and reports a USB interface so that stored pressure readings can be transferred to a computer for later analysis. To meet applicable quality assurance requirements within theme parks, a UKAS calibration certificate for traceability to international standards is supplied with this digital pressure gauge. Please complete form below to request a quote for Theme park ride pneumatic controls digital pressure test gauge. Send us your enquiry for Theme park ride pneumatic controls digital pressure test gauge to get assistance with this product type.